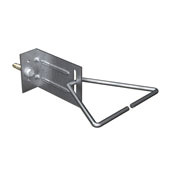 HB-5213 adjustable veneer anchor designed to anchor masonry to concrete, block or brick, accommodating rigid insulation up to 6 inches (75mm) thick. 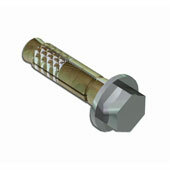 Furnished with one 7/16”Ø hole for use with 523 Brass Expansion Bolt. 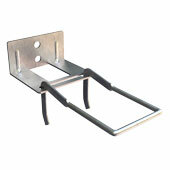 The L-shaped plate section has numerous ribs for added strength . 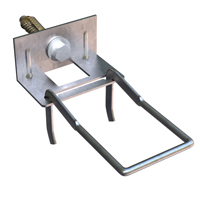 The eyelets allow 2X-HOOK™ (pintle) insertion (1 1/4" maximum allowable eccentricity) and are sized to prevent in-and-out movement beyond allowable tolerances. 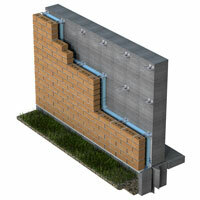 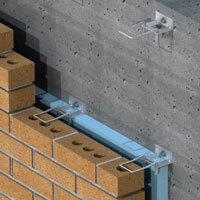 For metal stud construction, use the HB-213.